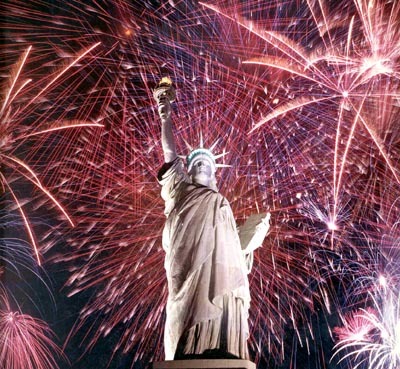 I love July 4, fireworks, patriotic songs, movies about the Revolution… all of it. That cop that sings “God Bless America” at Yankees games gets me every time I hear his wonderful tenor voice. But my allegiance isn’t here. It is in another land. Another place. Another kingdom. The country of my birth is a place I love. The Kingdom I serve and can’t wait to see in full is far greater. As is my King. To him, and his Kingdom, I will always pledge allegiance. The week is slipping by and with my wife still out of town, I’ve had a hard time remembering what day of the week I’m on! You can find the angst elsewhere. I wrestle with those issues as well… but on the 4th I love the fireworks, the music, the fun. When I left New Orleans to go to Mobile, Alabama on July 1, I took a cab to the airport to pick up a rental car. My driver was an immigrant from Costa Rica. He had come here four years ago, taken his ESL classes for two years at the University of New Orleans, and was now in his business program. He spoke of the hope he has for this country. He spoke of opportunity. He spoke of hard work and rising up to be anything he could dream. One of the things I think every American should go watch is a naturalization ceremony. The one I went to a year ago was like a NASCAR rally. Over 900 immigrants were there to take an oath of allegiance to the United States. They sang “God Bless the USA” and the Star Spangled Banner. They said the pledge. They swore their oath to the U.S.
I’m fairly sure even a Tea Party hardliner would have loved that ceremony. I love Jesus and my allegiance to him will far outweigh my allegiance to anything else. But spending the 4th with my oldest son and his wife, her family, and watching fireworks, along with meeting Pablo, I can easily say I love the 4th as well. It’s still a great country. It’s still a place of opportunity. There is still evidence of the DNA that was formed with this nation. It is still a great place to live. Let freedom ring. We can return the angst tomorrow. Have a SAFE 4th of July? As I reflect on independence, “safe” isn’t one of those words I come up with. That is not to say I want you to go blow yourself up. But, we’ve taken a national holiday and turned into safety camp. This is a day of celebration, for Americans, concerning independence. Something declared in the cauldron of war with the risk of being executed if they could not win that war. “Safe” just isn’t one of those words that should be associated with well wishes on this holiday. And don’t go blow your hand off, okay?